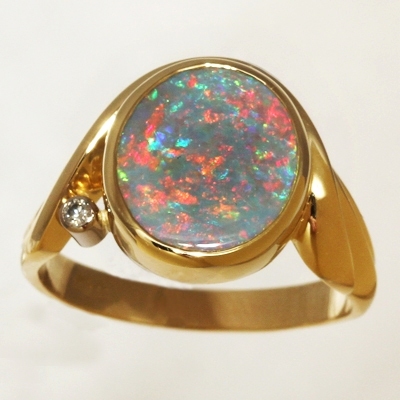 CUSTOM MADE 18k gold SOLID SEMI BLACK Opal Ring. Our Swiss born Jeweller completed a four year Goldsmith apprenticeship in Switzerland and and graduated her class with Honours. 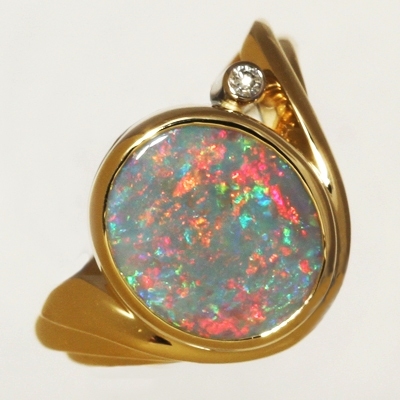 Over the last 30 years this award winning jeweller has created over 9000 pieces of jewellery, opal being her specialty! 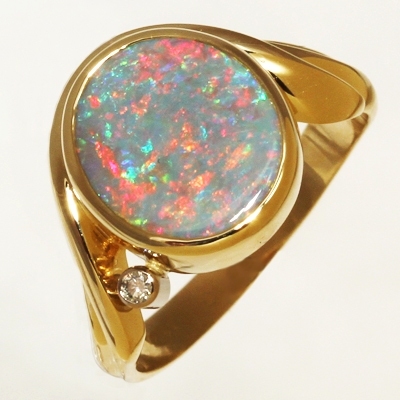 Her creations are aimed at clients who wish to have a piece of jewellery that is Individually designed, crafted to Swiss standard of quality; will remain in style and fashion for years to come and most importantly, represent a sound investment and an excellent value for money. Whilst her creations are more expensive than the mass-produced cheap jewellery flooding the market today, real quality takes enormous skill, hard work and time. 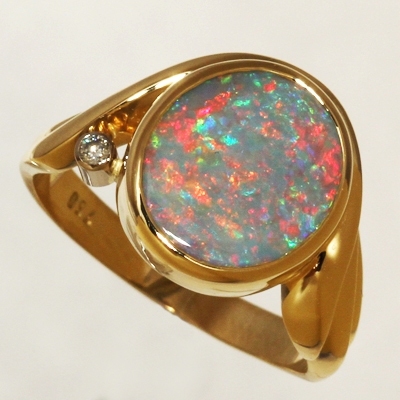 She believes that the individuality and the elegance of her designs, combined with excellent craftsmanship and very carefully chosen opals, are well worth the money. A beautiful Floral Harlequin patterned stone abundant with loads of bright colours. With NEON crisp red and neon orange, continually sparkling extremely bright and sharply amongst beautiful shades of green, turquoise and purple blue contrasting colours. The red and orange is always sparkling over the other colours, showing a strong glittery show from all angles. Just perfect in all lights. 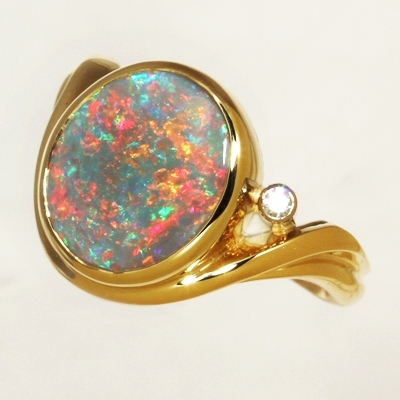 Gorgeous opal full of life and colour.